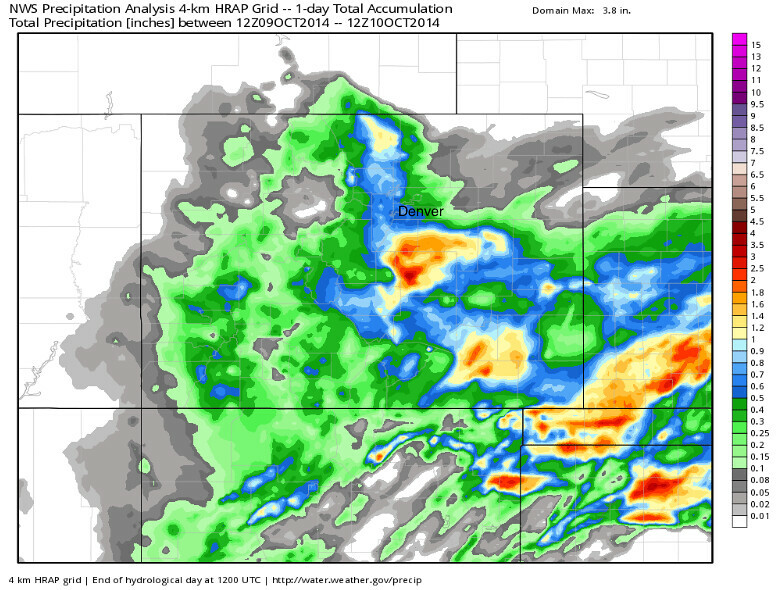 Precipitation analysis for yesterday’s rain event across Colorado is in, and it paints a pretty wet picture. As forecast, areas south of Denver did best with this system, but even northern Front Range communities saw anywhere from 0.5 to 2 inches of rain. Our weather station (2m S downtown Denver) received 0.59 inches from this system. The Colorado Springs area saw some of the greatest rainfall totals. COS airport reported a record 2.83 inches Thursday, crushing the old daily maximum rainfall for the date of 0.59 inches set in 1967. We’ll stay cool today, warm a bit for Saturday, before another shot of cooler air and precipitation chances return for Sunday across much of the state.